Matt Winters had spent 12 seasons in the minors by 1989, never getting the call up to the majors. That was until May, when his manager at AAA Omaha, Sal Rende, broke the news. Winters was going to Kansas City. Rende was happy for his player, as he was for all the others he had sent up the ladder in his six-season managerial career. But, speaking to reporters after Winters' call-up, Rende saw it as something more. "He's one of those guys you're glad for," Rende said in an account in The Pittsburgh Press, "especially all of us guys who never made it." Rende had spent seven seasons in the minors as a player himself, getting as high as AAA. But he never got the call-up. He also made the smooth transition, at the young age of 28, out of a playing career and into a managing career. And his baseball career continues into 2015 as a hitting coach for the Phillies at AAA Lehigh Valley. Rende's playing career began in 1977, taken in the 28th round of the draft by the Indians. He made AA Chattanooga his second year out and got a taste of AAA Tacoma in his third. Rende had some power. He hit 25 home runs twice, once in 1979 - one coming in a May AAA outing - and once in 1981. But AAA is where it would stall. His final three seasons were spent back at AA and his playing career ended in 1983, short of the majors. In what would be his final year, Rende started off hot. Playing for AA Buffalo, Rende's average would hit .409 at one point. But in just 63 games that year, Rende's average would come back to .253. For 1984, Rende arrived at the White Sox' single-A team in Appleton, as the manager. He was also among a young managing crop in the Midwest League that year that included Tom Gamboa and Joe Maddon. 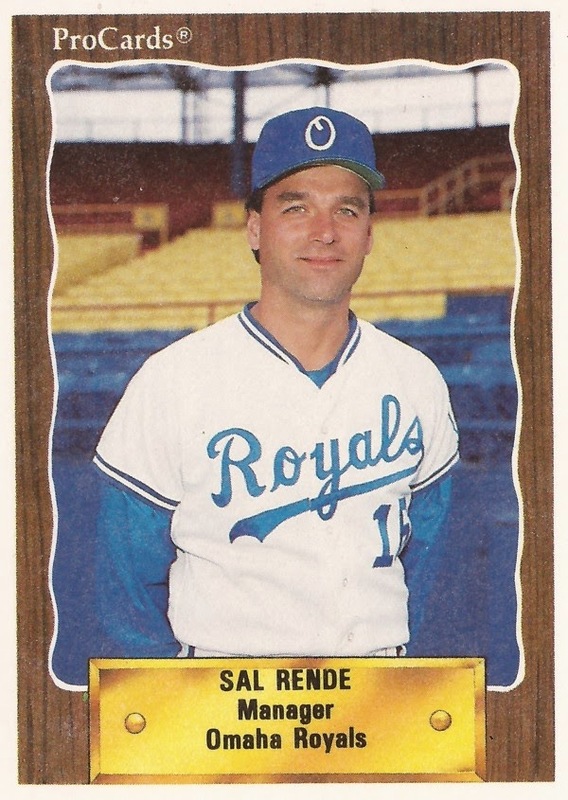 Rende arrived in the Royals system in 1988, managing AA Memphis, then Omaha in 1989. While he dealt with welcome news that year, there was also the serious news. Also on Rende's team early that season was troubled reliever Donnie Moore. By June, the Royals released Moore. Moore went home to California, shot and wounded his wife, then killed himself. Rende stayed with the Royals through 1991, when he joined the fledgling Marlins. And he quickly bought in to the Marlins' system. In June 1992, speaking to Marlins players at a training camp, told the players to imagine the Yankee mystique, according to The South Florida Sun-Sentinel. "I don't know if that's attainable in this day and age," Rende told The Sun-Sentinel. "I don't know if we can pull it off, but we're going to try." Rende was set to be the Marlins' AAA coach in Edmonton for 1993, but the 37-year-old did get an interview for the top job, a job that eventually went to Rene Lachemann. Rende was on the receiving end of tirades from two of his players at Edmonton, Carl Everett and Darrell Whitmore. With Everett, lack of hustle and a verbal confrontation with Rende sent him packing, according to Sports Illustrated. That same year, Whitmore shoved his manager and was suspended 10 games, according to an account in The Orlando Sentinel. Rende arrived in the Phillies system in 2004, after spending a year at the Yankees' AAA Columbus team. His tenure there was marked by disagreement over the development of Yankees prospect Drew Henson. Rende started as hitting coach at Lehigh Valley in 2011, a job he is continuing in 2015. In 2010, he gave advice to Phillies AAA first baseman Andy Tracy on the pitfalls AAA Home Run Derby. "I was talking to Sal about it," Tracy told the Allentown Morning Call earlier this month. "You get tired if you start hitting homers [since] you might be up there for 20-25 swings at a time."